If your Historic Homes Foundation System has failed, the fist step you need to hire professionals to make these repairs. Having cracks in walls of a historical home is some what normal, its when you see these cracks growing in size, sloping floors, windows and doors sticking, that’s when you should reach out to an engineer for help. Foundation replacement and/or major repair work is always a huge undertaking and you should hire a Foundation Contractor with a track record of working on Historic Home Foundations and Buildings. Follow these steps below for a successful Historical Foundation Repair. Your first step is to consult a Civil or Structural Engineer with Historic Home or Building Foundation Repair experience to determine how much of your foundation needs to be repaired or replaced. A Engineer will determine what the problem is and provide a set of drawings the needed to fix it. Your foundation is a major architectural feature, so it is important to make your new foundation look as much like the original as possible to retain the historic look of your house or building. Before the old foundation is removed, document your existing, original foundation. All experienced Historical Foundation Repair Contractors will know that the original look is very important, (if not) otherwise find a new foundation repair contractor. Hire a Foundation Repair Contractor with proven experience replacing the foundations of historic houses and buildings. Make certain the contractor has all the necessary insurance and permits. Your house or building will need to be lifted to remove the old foundation. 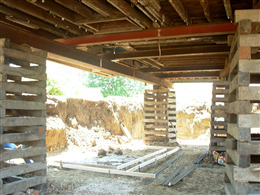 To lift the structure, cribbing will have to be installed under its framing. Cribbing is a set of massive beams criss-crossed under the perimeter-sill plate or sill beam as well as the floor joist framing. If you have a brick or stone foundation, be sure your new foundation has the same exterior look as the original. Most new foundations are done with poured concrete or CMU block. With proper planning, a masonry contractor can veneer the exterior of the concrete with any original stones or bricks you salvaged, or with new bricks or stones that closely match the originals. Ask the contractor to pull out any stones or bricks and pile it on your lot. You may consider saving these for future use.